Biography: Vidya Sudarshan is an Associate Faculty member at Singapore University of Social Sciences (SUSS), Singapore. She is also an Adjunct Lecturer in University of Newcastle, Singapore. She received her PhD from Nanyang Technological University (NTU), Singapore. She specializes in Biomedical Engineering and has more than 13 years of clinical and academic research experience. She has published more than 30 research papers. U Rajendra Acharya, Vidya K Sudarshan, Joel EW Koh, Roshan Joy Martis, Jeng Hong Tan, Shu Lih Oh, Adam Muhammad, Yuki Hagiwara, Muthu Rama Krishnan Mookiah, Kok Poo Chua, Chua k Chua, Ru San Tan. Application of higher-order spectra for the characterization of coronary artery disease using electrocardiogram signals. Biomedical Signal Processing and Control, Jan 2017; 31: 31-43. U Rajendra Acharya, Hamido Fujita, Muhammad Adam, Oh Shu Lih, Vidya K Sudarshan, Tan Jen Hong, Joel EW Koh, Yuki Hagiwars, Chua K Chua, Chua Kok Poo, Tan Ru San. Automated characterization and classification of coronary artery disease and myocardial infarction by decomposition of ECG signals: A comparative study. Information Sciences, 2017; 377:17-29. Vidya K Sudarshan, U Rajendra Acharya, Oh Shu Lih, Muhammad Adam, Tan Jen Hong, Chua Kuang Chua, Chua Kok Poo, Tan Ru San. Automated diagnosis of congestive heart failure using dual tree complex wavelet transform and statistical features extracted from 2 seconds of ECG signals. Computers in Biology and Medicine, 2017; 83: 48-58. U Rajendra Acharya, Hamido Fujita, Vidya K Sudarshan, Oh Shu Lih, Muhammad Adam, Tan Jen Hong, Koo Jie Hui, Arihant Jain, Lim Choo Min, Chua Kuang Chua. Automated characterization of coronary artery disease, myocardial infarction, and congestive heart failure using contourlet and shearlet transforms of electrocardiogram signal. Knowledge-Based Systems, June 2017. U Rajendra Acharya, Vidya K Sudarshan, Soon Qing Rong, Zechariah Tan, Lim Choo Min, Joel EW Koh, Sujatha Nayak, Sulatha V Bhandary. Automated prediction of premature delivery using uterine electromyography signals using empirical mode and wavelet packet decomposition techniques. Computers in Biology and Medicine, 85, April 2017. Venkataraman Anantharaman, Seow Yian Tay, Peter George Manning, Swee Han Lim, Terrance Siang Jin Chua, Mohan Tiru, Rabind Antony Charles, Vidya Sudarshan. A multicentre prospective randomized study comparing the efficacy of escalating higher biphasic versus low biphasic energy defibrillations in patients presenting with cardiac arrest in the in-hospital environment. Open Access Emergency Medicine, 13 January 2017. U Rajendra Acharya, Yuki Hagiwara, Vidya K Sudarshan, Wai Yee Chan, Kwan Hoon Ng. Towards precision medicine: From quantitative imaging to radiomics. Journal of Zhejiang University Science B, 2017, September. U Rajendra Acharya, Hamido Fujita, Vidya K Sudarshan, Shu Lih Oh, Adam Muhammad, Joel EW Koh, Jen Hong Tan, Chua K Chua, Kok Poo Chua, Ru San Tan. Application of empirical mode decomposition (EMD) for automated identification of congestive heart failure using heart rate signals. Neural Computing and Applications, 2017; 28: 3073-3094. Yuki Hagiwara, Vidya K Sudarshan, Sook San, Anushya Vijayananthan, Kwan Hoong Ng. Application of entropies for automated diagnosis of abnormalities in ultrasound images: A review. Journal of Mechanics in Medicine and Biology, 2017; 17: 1740012 (12 pages). U Rajendra Acharya, Wei Lin Ng, Kartini Rahmat, Vidya K Sudarshan, Joel EW Koh, Jen Hong Tan, Yuki Hagiwara, Arkadiusz Gertych, Farhana Fadzli, Chai Hong Yeong, Kwan Hoong Ng. Shear wave elastography for characterization of breast lesions: shearlet transform and local binary pattern histogram techniques. Computers in Biology and Medicine, 2017. Muhammad Adam, Oh Shu Lih, Vidya K Sudarshan, Joel EW Koh, Yuki Hagiwara, Tan Jen Hong, U Rajendra Acharya. Automated characterization of cardiovascular diseases using relative wavelet nonlinear features extracted from ECG signals. Computers Methods and Programs in Biomedicine, 2017 (Under Review). Hamido Fujita, U Rajendra Acharya, Vidya K Sudarshan, Dhanjoo N Ghista, S Vinitha Sree, Lim WJ Eugene, Joel EW Koh. Sudden cardiac death (SCD) prediction based on nonlinear heart rate variability features and SCD index. Applied Soft Computing, 2016; 43: 510-519. U Rajendra Acharya, Hamido Fujita, Vidya K Sudarshan, Joel EW Koh, Jen Hong Tan, Chua KC, Junnarkar Sameer Padmakumar, Anushya Vijayanathan, Kwan Hoong Ng. An integrated index for identification of fatty liver disease using radon transform and discrete cosine transform features in ultrasound images. Information Fusion, 2016; 31: 43-53. Vidya K Sudarshan, Muthu Rama Krishnan Mookiah, U Rajendra Acharya, Vinod Chandran, Filippo Molinari, Hamido Fujita, Kwan Hoong Ng. Application of wavelet techniques for cancer diagnosis using ultrasound images: A review. Computers in biology and medicine, 2016; 69: 97-111. Vidya K Sudarshan, U Rajendra Acharya, EYK Ng, Ru San Tan, Siaw Meng Chou, Dhanjoo N Ghista. An integrated index for automated detection of infarcted myocardium from cross-sectional echocardiograms using texton-based features (Part 1). Computers in biology and medicine, 2016; 71: 231-240. Vidya K Sudarshan, U Rajendra Acharya, EYK Ng, Ru San Tan, Siaw Meng Chou, Dhanjoo N Ghista. Data mining framework for identification of myocardial infarction stages in ultrasound: A hybrid feature extraction paradigm (part 2). Computers in biology and medicine, 2016; 71: 241-251. Vidya K Sudarshan, EYK Ng, U Rajendra Acharya, Ru San Tan, Siaw Meng Chou, Dhanjoo N Ghista. Infarcted left ventricle classification from cross-sectional echocardiograms using relative wavelet energy and entropy features. Journal of mechanics in medicine and biology, 2016; 16: DOI: 10.1142/S0219519416400091. U Rajendra Acharya, Hamido Fujita, Vidya K Sudarshan, Shu Lih Oh, Muhammad Adam, Joel EW Koh, Jen Hong Tan, Dhanjoo N Ghista, Roshan Joy Martis, Chua K Chua, Chua Kok Poo, Ru San Tan. Automated detection and localization of myocardial infarction using electrocardiogram: a comparative study of different leads. Knowledge-Based systems, 2016; 99: 146-156. U Rajendra Acharya, Hamido Fujita, Shreya Bhat, Joel EW Koh, Muhammad Adam, Dhanjoo N Ghista, Vidya K Sudarshan, Chua K Poo, Chua K Chua, Filippo Molinari, EYK Ng, Ru San Tan. Automated diagnosis of diabetes using entropies and diabetic index, Journal of mechanics in medicine and biology, 2016; 16: DOI: 10.1142/S021951941640008X. Sharon Yeo, Hen Hong Tan, U Rajendra Acharya, Vidya K Sudarshan, Louis Tong. Longitudinal changes in tear evaporation rates after eyelid warming therapies in Meibomian gland dysfunction. Investigative Ophthalmology and Visual Science, 2016; 57: 1974-81. U Rajendra Acharya, Wei Lin Ng, Kartini Rahmat, Vidya K Sudarshan, Joel EW Koh, Tan Jen Hong, Yuki Hagiwara, Chai Hong Yeong, Kwan Hoong Ng. Data mining framework for breast lesion classification in shear wave ultrasound: A hybrid feature paradigm. Biomedical Signal Processing and Control, 2016, DOI: http://dx.doi.org/10.1016/j.bspc.2016.11.004. U Rajendra Acharya, U Raghavendra, Hamido Fujita, Yuki Hagiwars, Joel EW Koh, Tan Jen Hong, Vidya K Sudarshan, Anushya Vijayanathan, Yeong Chai Hong, Anjan Gudigar, Kwan Hoong Ng. Automated characterization of fatty liver disease and cirrhosis using curvelet transform and entropy features extracted from ultrasound images. Computers in Biology and Medicine, 2016; 79: 250-258. Oliver Faust, U Rajendra Acharya, Vidya K Sudarshan, Tan Ru San, Chai Hong Yeong, Filippo Molinari, Kwan Hoong Ng. Computer aided diagnosis of coronary artery disease, myocardial infarction and carotid atherosclerosis using ultrasound images: A review. Physica Medica: European Journal of Medical Physics, 2016. U Rajendra Acharya, Tan Jen Hong, Joel EW Koh, Vidya K Sudarshan, Sharon Yeo Wan Jie, Too Cheah Loon, Chua Kuang Chua, Louis Tong. Automated diagnosis of dry eye using infrared thermography images. Infrared Physics & Technology, 2015; 71: 263-271. U Rajendra Acharya, Vidya K Sudarshan, Dhanjoo N Ghista, Lim Wei Jie Eugene, Filippo Molinari, Meena Sankaranarayanan. Computer-Aided Diagnosis of diabetic subjects by HRV signals using discrete wavelet transform method. Knowledge-Based Systems, 2015; 81: 56-64. Vidya K Sudarshan, U Rajendra Acharya, EYK Ng, Chou Siaw Meng, Ru San Tan, Dhanjoo N Ghista. Computer-Aided diagnosis of myocardial infarction using ultrasound images with Texture, DWT and HOS methods: A Comparative study. Computers in Biology and Medicine, 2015; 62: 86-93. Ng KH, Oliver Faust, Vidya K Sudarshan, Subhagata Chattopadhyay. Data overloading in medical imaging: emerging issues, challenges and opportunities in efficient data management. 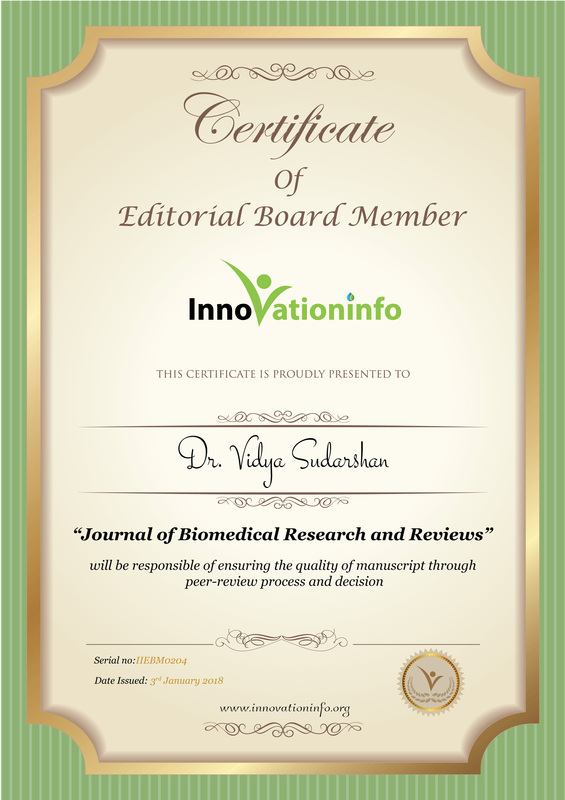 Journal of medical imaging and health informatics, 2015; 5. U Rajendra Acharya, Hamido Fujita, Vidya K Sudarshan, Vinitha Sree, Lim Wei Jie Eugene, Dhanjoo N Ghista, Ru San Tan. An integrated index for detection of sudden cardiac death (SCD) using discrete wavelet transform and nonlinear features. Knowledge-Based systems, 2015; 83: 149-158. U Rajendra Acharya, Vidya K Sudarshan, Hojjat Adeli, Jayasree S, Joel EW Koh, Amir Adeli. A novel depression diagnosis index using nonlinear features in EEG signals. European Neurology, 2015; 74: 79-83. U Rajendra Acharya, Vidya K Sudarshan, Hojjat Adeli, Jayasree S, Joel EW Koh, Amir Adeli. Computer Aided diagnosis of depression using EEG signals. European Neurology, 2015; 73: 329-336. U Rajendra Acharya, H Fujita, Vidya K Sudarshan, Shreya Bhat, Joel EW Koh. Application of entropies for automated diagnosis of epilepsy using EEG signals: A review. Knowledge-based systems, 2015; 88: 85-96. Prajna Upadhyaya, Muralidhar G Bairy, Vidya K Sudarshan. Electroencephalograms analysis and classification of neurological and psychological disorders. Journal of medical imaging and health informatics, 2015; 5: 1415-1419. Acharya UR, Tan JH, Vidya KS, Sharon Yeo WJ, Too CL, Lim Wei JE, Chua KC, Louis T. Diagnosis of response and non-response to dry eye treatment using infrared thermography images. Infrared Physics and Technology, 2014; 67: 497-503. U Rajendra Acharya, Vidya K Sudarshan, Shreya Bhat, Hojjat Adeli, Amir Adeli. Computer-aided diagnosis of alcoholism-related EEG signals. Epilepsy & Behavior, 2014; 41: 257-263. U Rajendra Acharya, Oliver Faust, Filippo Molinari, S Vinitha Sree, Junnarkar Sameer Padmakumar, Vidya K Sudarshan. Ultrasound-Based tissue characterisation and classification of fatty liver disease: a screening and diagnostic paradigm. Knowledge-based Systems, 2014; 75: 66-77.